The genre of Wargames has been a bit intimidating for me in the learning time, gameplay time, and understanding the fun aspects of the game style. Hammer of the Scots has captured my interest almost immediately for a few reasons. First, Shut Up & Sit Down called it, "The Very Best Introductory Wargames". I raised an eyebrow with intrigue after seeing such a high recommendation from one of my favorite review groups. Second, after diving into the overall feeling of how the game works I could see the brilliance of the design choices that will facilitate strategic and fun gameplay. The game highlights two very cool mechanics that set it apart from other war games. Fog of War and Step Reduction mechanics. What makes these exciting is that it embodies the feeling of real battle in elegant ways that work well for gaming. The Fog of War mechanic is implemented by having the blocks face the controller of the army only. Each player can see the number of units but not the type. It reminds me of the very similar mechanic in Stratego. You get an overall sense of the attacking forces but not the individual power of each. The Step Reduction mechanic is a simple twist on the traditional full strength/weakened state of units in war games. Using the blocks themselves you simply rotate the block 90 degrees to indicate the state of the unit with the status at the top. 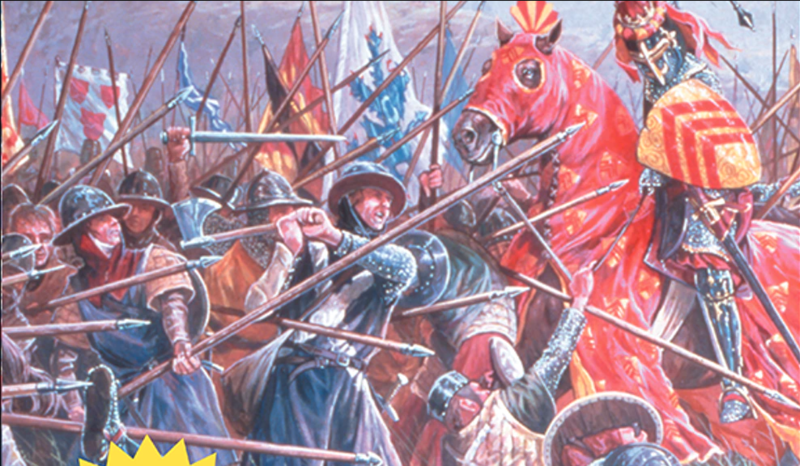 Hammer of the Scots looks like a great way to get into war games and is only $79 for the deluxe edition. Check it out before the campaign ends on April 20th 2019. See more about the game on the Kickstarter page! Check it out before it ends on April 20th, 2019!